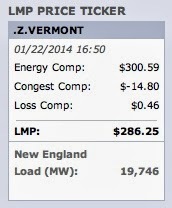 Today was a horrible day at Vermont Yankee. A year from now, the plant will be closed. Most people who work at the plant will be able to work there for only one more year. However, some people will (probably) be involved in doing the decommissioning assessment, and they have two years of work ahead of them. Today, Entergy announced who will have a year, and who will have two years. The people at the plant referred to this as "the list was out." I wasn't at the plant of course, but from what I read (mostly on Facebook) this was the worst day ever at the plant. Gratitude if you were one of the "lucky ones" was offset by misery at the fact that so many of your friends were "unlucky." What can I say? I wanted the plant to keep operating. People work together for years to do something good, and in an afternoon, most of the good feelings were destroyed. I need to tell a story about a layoff. I was working at a software company, and there was a massive layoff. I survived it, and thought I was so very lucky. I guess I was. A woman I knew --- she screamed when our boss told her. I heard her. Everybody heard her. It was horrible, hearing that scream. Well. The thing about being laid off is that the person generally gets another job. But where do they get a job? Obviously, they get a job at a company that is hiring. A company that is growing. A company that is doing well. And that is what happened. She got a job within a few months and rose very quickly at that new company. Meanwhile, lucky me, the not-laid-off-person, well...I stayed at the same company and merely hoped to survive the next layoff. I also thought...man, if I am the next person laid off, I am definitely looking my friend up! She's doing so well! She might be able to help me! Who is lucky and who isn't? It isn't clear. In general, one year or two years from now, there will be no comparable jobs in Windham County. One or two years from now, people will be deciding to stay or to leave. I personally think that the people who leave will get good jobs...at companies that are hiring. This is a miserable situation and I don't mean to be a Pollyanna. People are being torn right out of their community of work and friendship. Still, people will go on and have good lives. This event is a lot closer to a divorce than a death. Grief doesn't know, though. Grief feels like grief even if it is "just a divorce." To me, this very dark song has always been somewhat comforting. So I share it. I mean well by sharing it. I know it won't be everyone's cuppa. Environmentalists who have lumped nuclear with "other bad stuff," but may not have given the matter much thought. They often come to realize the role of nuclear energy in providing very low carbon electricity. People who are just plain against nuclear energy. Period. End of story. You have to know who you are talking to. For example, these two groups will have very different assessments of the recent German experience. Many environmentalists (people interested in a healthy environment) are beginning to embrace nuclear power. 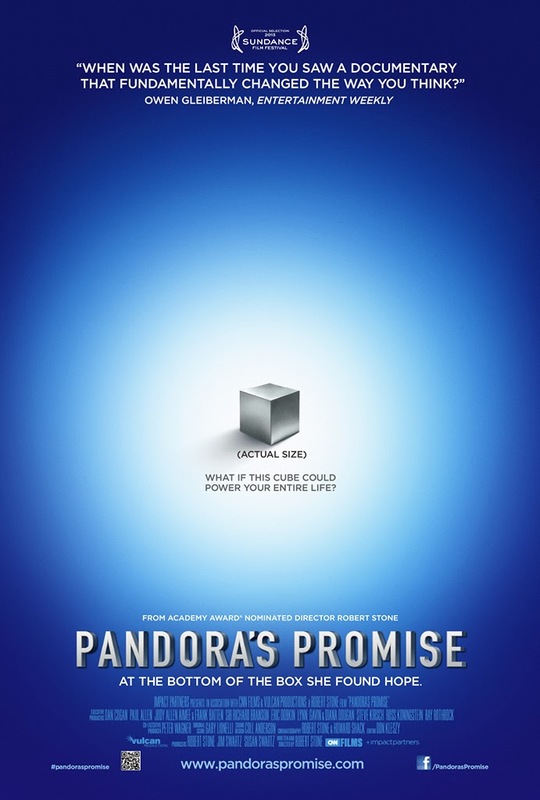 The movie Pandora's Promise is about one such set of environmentalists. Similarly, Armond Cohen, a leading environmentalist in California, noted that greenhouse gas emissions in California rose substantially when San Onofre went off-line. 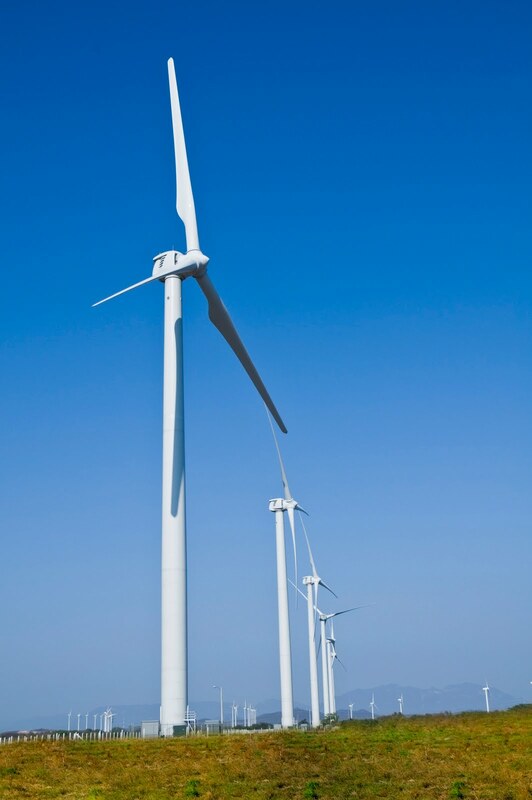 Cohen also realized that renewable sources, such as wind turbines, require huge amounts of land to make the same amount of power as a relatively small nuclear plant. As described in this VPR interview, Cohen explains why he has reluctantly shifted from being an anti-nuclear activist to someone who now argues that we can't afford to dismiss nuclear power. At the Washington Post last month, Stephen Stromberg wrote Why Environmentalists Should Hope Nuclear Power Sticks Around. He illustrated his article with a chart showing the two low-carbon power sources in the United States: renewables and nuclear. By 2040, U.S. renewables are expected go from producing 12% of our electricity (today) to 16% in 2040. Nuclear energy's contributes 19% today and 16% in 2040. It is an important part of our low-carbon future. Meanwhile, in Europe, greenhouse gas targets remain in place, but renewable targets are being scrapped. Gail Marcus of Nuke Power Talk gives an excellent overview in her latest blog post: Good News From Europe: Reasoned Approaches to Energy Policy. 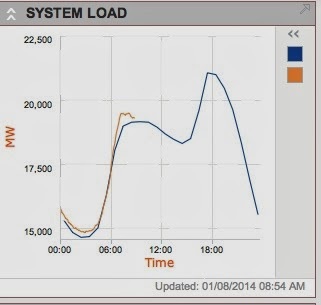 Money for Nothing: German wind turbines and solar panels useless during coldest, darkest part of the year. In the second post, Bas Gresnigt (from The Netherlands) comments that the German people are happy with the German electrical grid, because they are pleased to see nuclear be phased out. Which brings us to a question: what is the purpose of the German energy transition? If it is about greenhouse gases, it frankly isn't working, as Steve Aplin (and others) point out. But maybe it isn't about environmentalism, lowering the carbon footprint, or anything like that. Maybe it is mostly about being opponents of nuclear energy. Rod Adams posted about fossil fuels versus nuclear energy: Smoking gun research continuing in earnest. 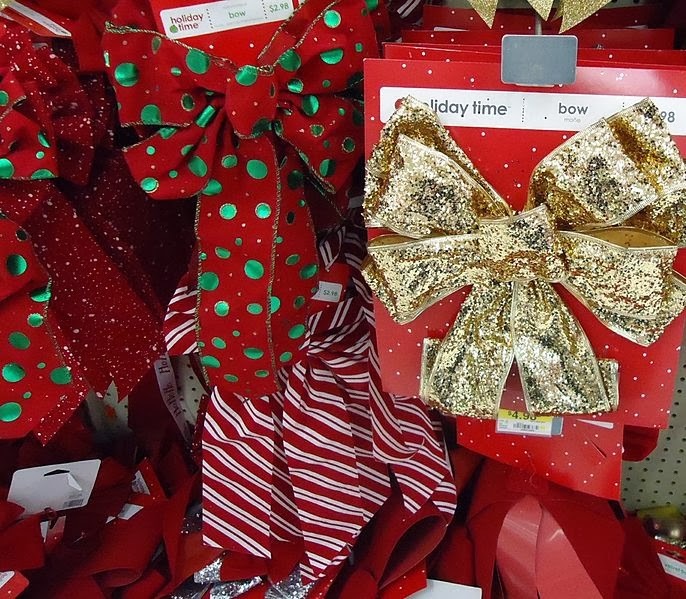 This post was published in early December 2013, and now has 145 comments. "Does the current German electricity market situation really make sense to you?" I contacted Gresnigt and asked him if I could use this quote. He was kind enough to give permission, though he felt the brief statement of this quote was somewhat unfair to his arguments. I hope he will comment on this blog post. People looking at the German experience can look at it as a colossal failure (higher carbon dioxide, higher prices) or a great success (phasing out nuclear plants). For a group for whom "anything is better than nuclear energy," no amount of communication is likely to make a difference. For environmentalists concerned with land use and with greenhouse gases, nuclear communicators can use the German experience as an example of a situation in which, as they say: mistakes were made. When the State of Vermont holds a major public hearing about Vermont Yankee and almost no-one attends, what does it mean? I was asking myself this question as I waited, virtually alone, to testify at a well-announced public hearing Tuesday, January 14 in the Vermont Interactive Television studio in Williston. The subject of Vermont Yankee usually draws a big, passionate crowd, with both supporters and opponents eager to express their views. Yet on this night, most of the state's 13 interactive TV studios were empty. I was the only person to testify in the only studio located in populous Chittenden County. For lack of testimony, the meeting ended an hour and a half earlier than scheduled. The Vermont Public Service Board had called the meeting to solicit comment from all Vermonters about Vermont Yankee's request to operate through the end of 2014. A PSB decision on whether to grant a Certificate of Public Good, a requirement for the plant to continue to operate in 2014, is expected by March 31. A lot is riding on that decision. In the recent years through 2012, Vermont Yankee provided about a third of all electricity consumed in Vermont, and still had plenty to sell to the rest of New England. Since opening in the early 1970’s, Vermont Yankee has made about three-quarters of the total power produced in Vermont. Last August, plant owner Entergy announced that (due mostly to the very low market cost of electricity), the plant would close in 2014. 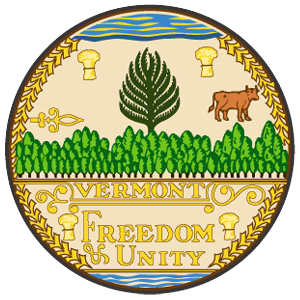 On December 23, the State of Vermont and Entergy announced a master settlement of most of their differences. The agreement says Entergy will close the plant, proceed with safe, responsible decommissioning, and will pay $10 million for economic re-development of Windham County and $5.2 million into a state fund for renewable power. Both sides will drop the many expensive legal disputes now in federal courts. The agreement also specifically requires Public Service Board approval to operate Vermont Yankee through 2014. So if approval is denied, the settlement falls apart and has to be entirely re-negotiated or litigated. Supporters of the settlement include Governor Peter Shumlin, Attorney General William Sorrell, and many legislative leaders. 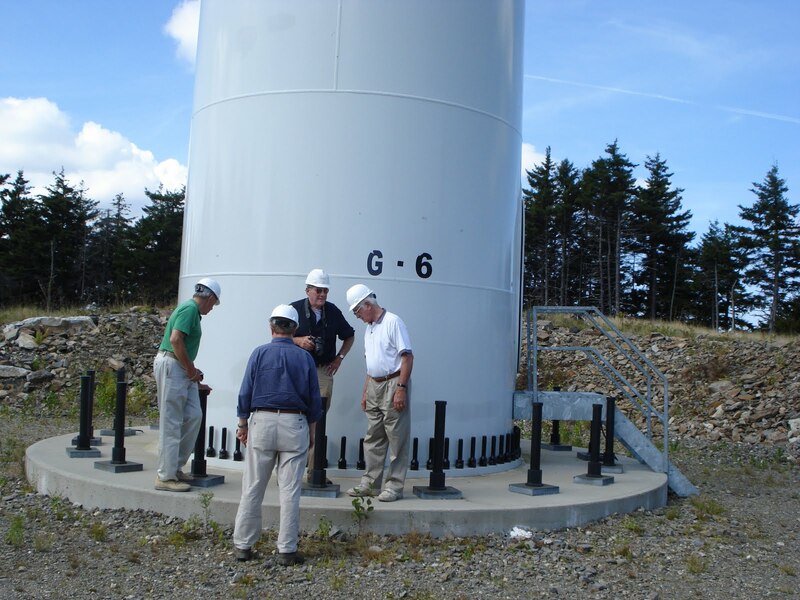 The financial aid is a continuation of Vermont Yankee's longstanding practice of supporting the Windham County economy and the state's renewable power future. The plant has long been the cornerstone of the local economy and virtually the sole funder of the Vermont Clean Energy Development Fund. Entergy needs PSB approval because the plant's workers need to know they will have their jobs until sometime near the end of this year, giving them time to find new work, homes, and schools. In short, PSB approval is highly desirable for Vermont Yankee workers, for the area's economic recovery, and for the state's renewable power future. I appeared at the hearing to tell the Public Service Board essentially what I have been saying since co-founding the Partnership seven years ago: an operational Vermont Yankee helps the economy, ratepayers, taxpayers, and environment of our beloved state. Indeed, even without a settlement agreement, Vermont Yankee’s continued operation is in the state’s best interest. And now finally I return to the question: why didn't more people attend? Perhaps it is because, as Attorney General Sorrell said at the Dec. 23 master settlement announcement, it is time for peace. Most Vermonters, at long last, have found common ground on Vermont Yankee. Under the settlement, the plant will close; the expensive federal lawsuits are history; economic and environmental needs are addressed. It's a good deal for everyone and the PSB should swiftly approve the Certificate of Public Good. Brad Ferland, a resident of St. Albans Town, is president of the Vermont Energy Partnership (www.vtep.org), a Montpelier-based coalition of more than 90 businesses, labor organizations, not-for-profits, and individuals committed to a clean, safe, affordable, and reliable energy future for Vermont. This is one of a series of posts containing people's comments to the Public Service Board about the Vermont Yankee agreement. 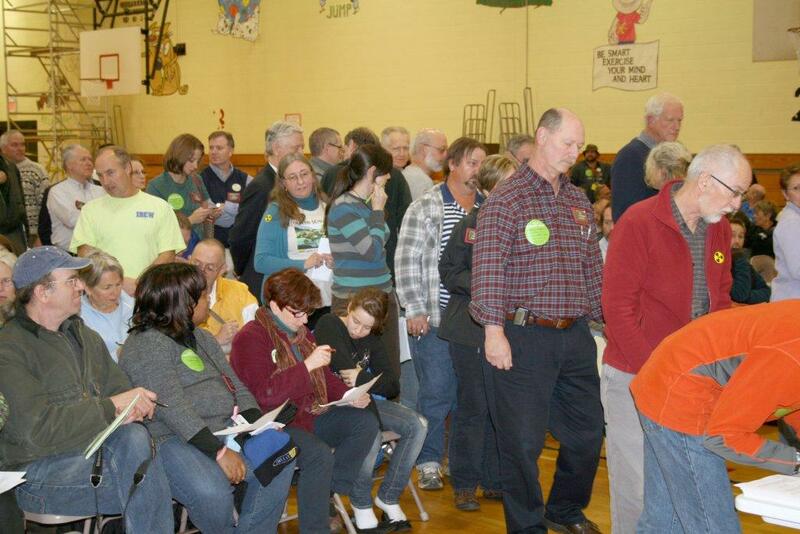 The comments describe some of the reasons the Board should grant a Certificate of Public Good (CPG) to Vermont Yankee. I hope these examples will inspire you to write your own comment to the board. Here's the link for comments. I would like to address one small, but for Vermont, significant aspect of the public good served by Entergy Vermont Yankee (EVY). 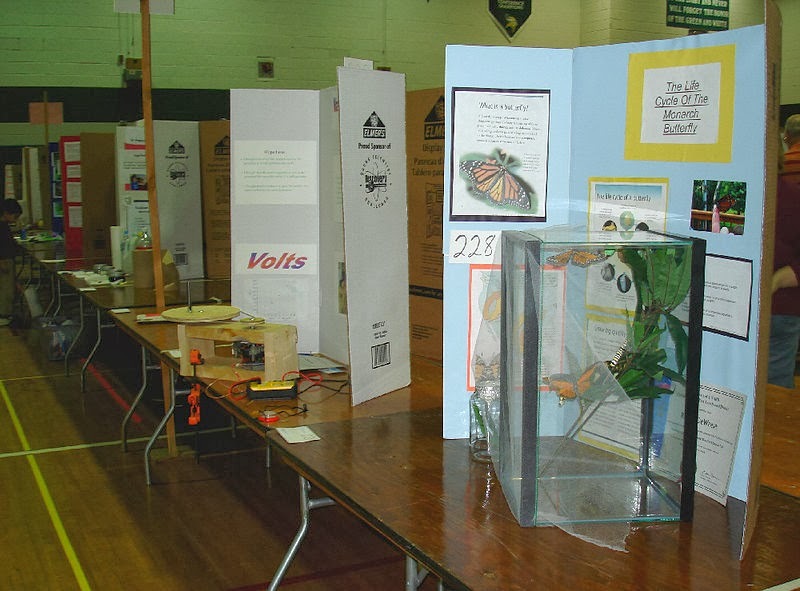 The Vermont State Science and Mathematics Fair (VSSMF) is the premier STEM competition in the state for grades 5-12. Each year it awards nearly $1,000,000 in scholarships to Vermont Colleges and Universities. It also awards prizes and trips to compete in national and international STEM competitions by our best students and their teachers. VSSMF is an all-volunteer organization. For the past seven of the 10 years the VSSMF has been affiliated with these national and international competitions, EVY has been one of our biggest supporters, providing 6% of our $25,000 annual budget and two to six judges. Nothing can impact Vermont more significantly than inspiring its youth to get excited about STEM. I propose that for this reason alone, EVY should be granted the amended Certificate of Public Good. 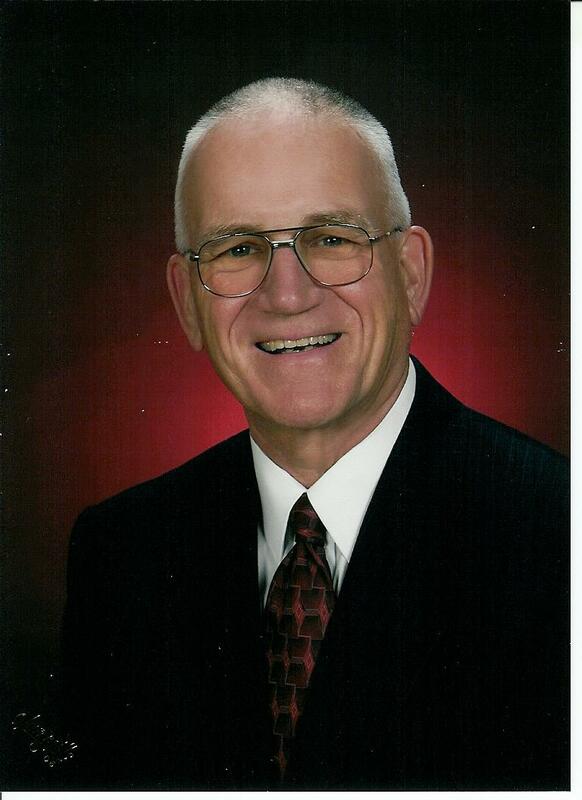 Carlos Pinkham is Professor Emeritus of Biology at Norwich University. 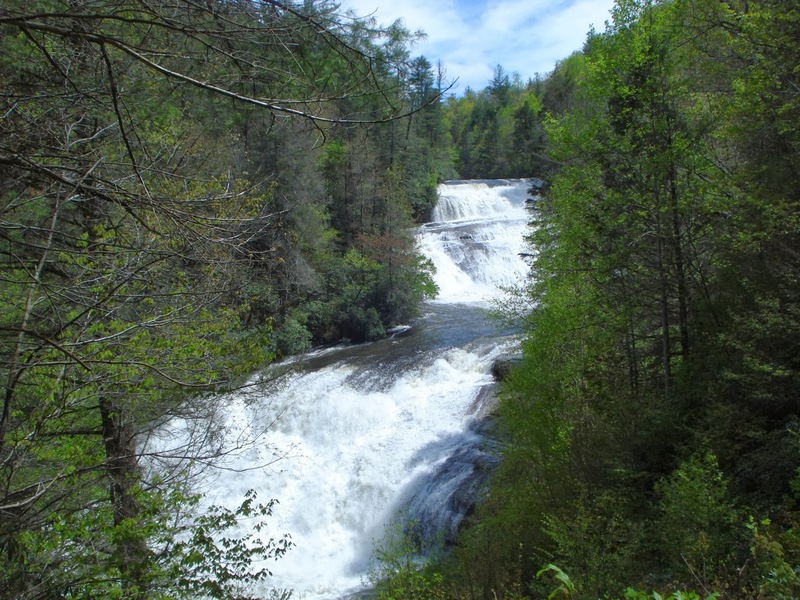 Courses taught included Environmental Biology. Former Environmental Science Officer and Senior Consultant for Army Reserve and National Guard Preventive Medicine Science Officers. Yesterday, ANS Nuclear Cafe posted Howard Shaffer's blog post The Art of the Deal. In this post, Shaffer summarizes the Entergy-Vermont deal which will be presented to the Public Service Board. In the hearings about the deal, Entergy AND Vermont state agencies will be in support of the deal. They will mutually support the Public Service Board granting Entergy a Certificate of Public Good for operation through 2014, based on the agreement. The sight of Entergy and state agencies supporting each other in front of the Public Service Board--Wow. What a wonderful sight that will be. It surely has not happened since Governor Shumlin was elected! And now it will happen. This is truly a New Deal and a Big Deal, and Howard describes it very well. He also describes the ways the opponents are likely to fight it, and why they are unlikely to win. Where does this leave the PSB? With an easier task than before.... Now, with the state and Entergy together—...—it will be hard to find something that will not be in the public good. It is expected that the PSB will complete the hearings to give the opponents their “day in court,” and perhaps impose a few administrative conditions, and then approve the CPG. But really: read the whole Art of the Deal, not just this excerpt! Welcome to the blog Atoms for California! Okay, Meredith, I can just hear my readers say---California is not "local" to Vermont. What are you talking about with "another local pro-nuclear blogger"? California is indeed across the country from Vermont, but I want to welcome another locally-focused blog. Every pro-nuclear blogger has his or her own area of interest and expertise--our blogs are not interchangeable. 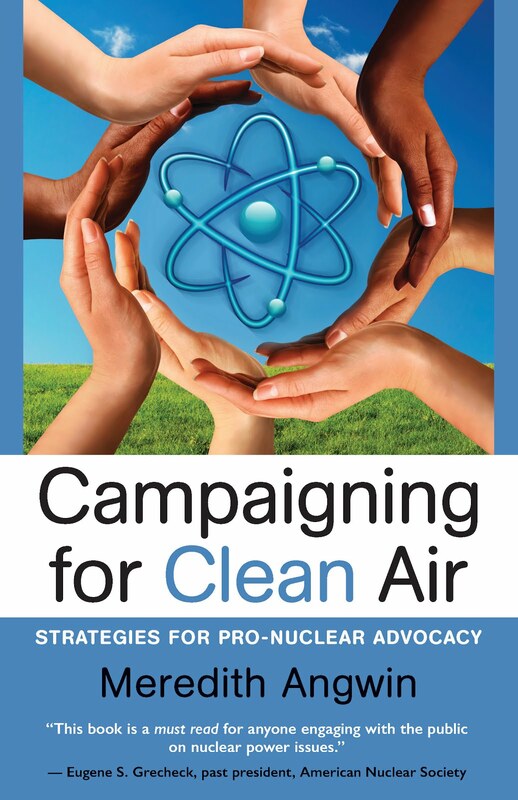 My blog list includes an amazing group of powerful pro-nuclear voices. We need all these voices. That said, I believe that locally-focused blogs can be particularly strong and effective. Local people know the history, background, issues, and chief players of their own locality. For example, I am authoritative about what happens (and is likely to happen) at the Statehouse in Montpelier. It would be hard for me to know very much about which type of reactor the Czech Republic is most likely to buy. 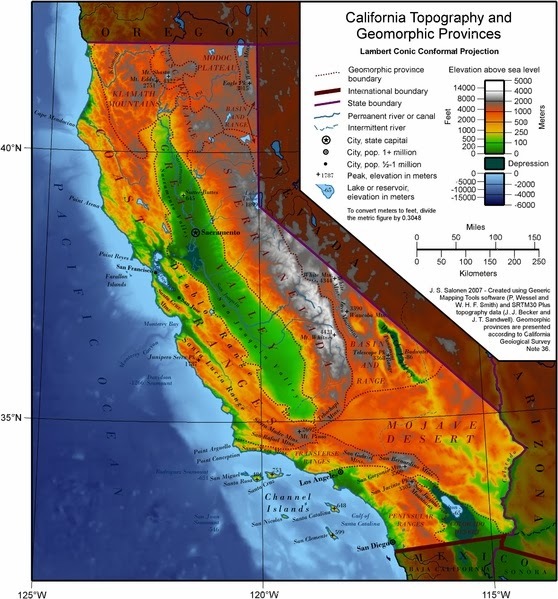 Atoms for California is very impressive pro-nuclear blog, written by a man who truly knows the situation in California. In the Author Disclaimer section of the blog, we learn that the blog author's father works as a senior nuclear engineer at San Onofre, and he himself works for the California Energy Commission. The blogger makes it very clear that this is his personal blog, and has nothing to do with the Commission. The Table of Contents provides a wealth of material, including a history of the Electric Program Investment Plan (EPIC) in California. The "Objectives of this site" page is not a quick mission statement, but a nine-point program with statements such as Challenging the exclusion of nuclear power from California’s Loading Order. This is a blog to read! Local bloggers can grow local followings. Local bloggers can be well-enough known to be interviewed repeatedly by the local press. I have often thought that every locality with a nuclear facility needs a local pro-nuclear blogger. Every such locality has at least one anti-nuclear group with a web presence. The reporters know where to find the anti-nuclear quotes. We need to give the reporters a place to find the pro-nuclear quotes. So--hats off to the local pro-nuclear bloggers! Hats off to Atoms for California, Steve Aplin at Canadian Energy Issues, and Ben Heard at DecarboniseSA. These blogs are not strictly local--after all the world is interconnected. But they start with their local issues, and they have powerful local impacts. Think globally, act locally. I hope more people will start blogging. Update: I rearranged this post a little in order to do a better job of featuring the Atoms for California blog. And a hat-tip to Rod Adams for his welcome to Atoms for California. Rod got his post up first, as he often does. I don't know where any of us pro-nuclear bloggers would be without Rod! 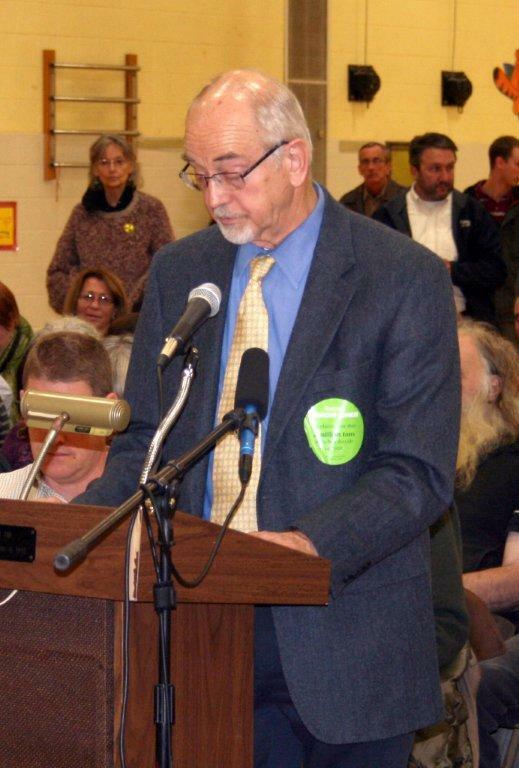 As a longtime public servant with over 50 years experience in energy and economic management, I am in full support of the Certificate of Public Good (CPG) for Vermont Yankee. 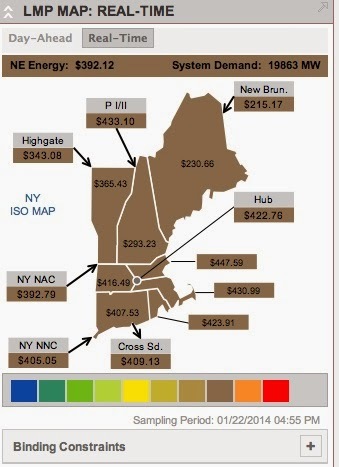 Your approval of the CPG will assure all the New England states another year of low-cost, clean, reliable electricity from one of its base load merchant plants. This is a matter of increasing importance, as the grid's operators are now warning of a looming supply shortfall. Closer to home, approval of the CPG will enable Brattleboro and Windham County to receive the proposed Entergy economic development money totaling $10 million over five years. This is the result of a good-faith effort by State and Entergy leaders to offset the terrible economic loss that will occur when the plant closes by the end of 2014. In fact, I understand the December 2013, Entergy/Vermont proposed settlement is entirely contingent on CPG approval. Without the CPG, Vermont loses not only the $10 million in economic development funding, but also $5 million earmarked for clean energy development. It also risks reversion to the lamentable legal state of affairs in which the two parties were engaged before the agreement. Please approve the CPG and thereby insure the continuation of this important agreement. 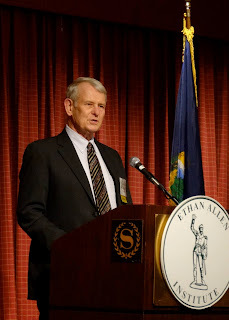 Milton Eaton has had a distinguished career as a public servant, including serving as Cabinet Secretary of Development and Community Affairs for the State of Vermont. At the federal level, he was East Asia Representative to the Department of Energy and Energy Attaché at the American Embassy in Tokyo. In the private sector, Eaton founded a five-office business brokerage firm, based in Brattleboro. I am a supporter of Vermont Yankee. 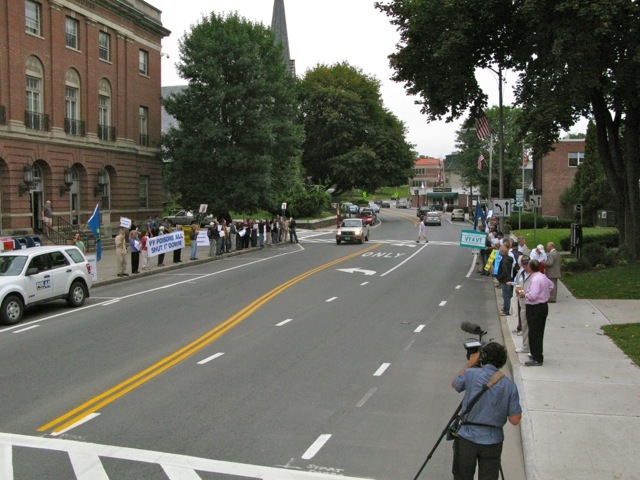 I remember standing on the streets of Brattleboro while the federal court case was underway. I held up my "Vermont Yankee" sign and the opponents held up signs saying "I support Vermont." In those days, it was "Vermont Yankee" versus "Vermont." 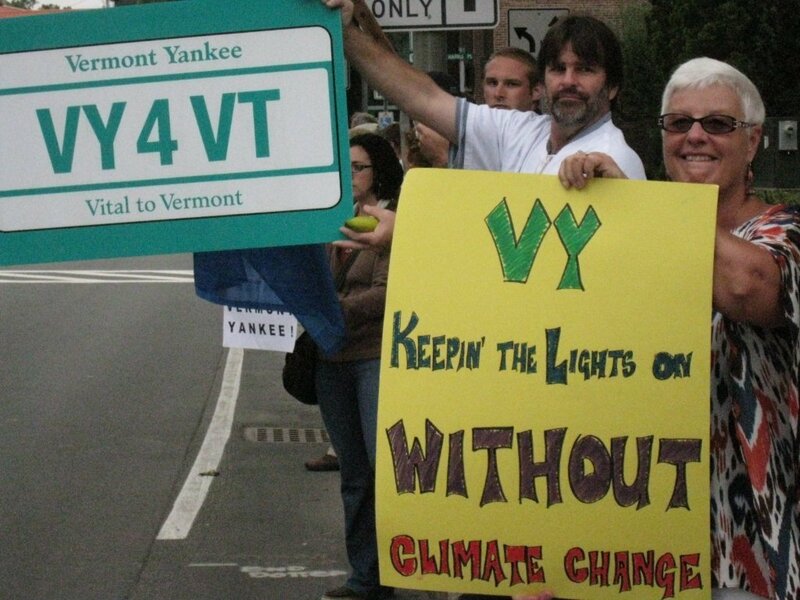 Vermont and Vermont Yankee have come to an agreement. This agreement will provide an orderly shut-down of the plant, support for Windham County and plant employees, and an end to lawsuits. Vermont and Vermont Yankee are on the same side now. Please support the state agencies of Vermont AND the workers of Vermont Yankee. Grant a Certificate of Public Good based on the state agreement with Vermont Yankee. This is one of a series of posts: people's comments to the Public Service Board in favor of granting a Certificate of Public Good (CPG) to Vermont Yankee for its final year of operation. For more information on the Public Service Board hearings and the Memorandum of Understanding, see the blog post Take Action: Comments to the Public Service Board. It has many links to background information. Yesterday's post was John McClaughry's excellent comment about whether Entergy could trust the state of Vermont. The opponents of everything nuclear, and particularly of Vermont Yankee, are out in full throat one more time to persuade this Board that “Entergy can’t be trusted," and that the Board should not issue a CPG for the final ten months of plant operation. 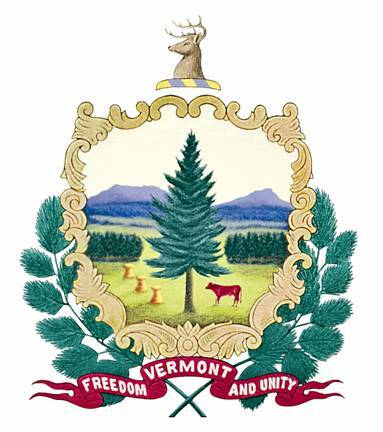 As a pro-nuclear former Senator with no direct personal interest in the outcome, I would like to call your attention to the fact that it is the State of Vermont that can’t be trusted, not Entergy. The MOU of 2002 between the state and Entergy set out the rules that the two parties would observe. One was that if Entergy wanted to prolong the plant’s operation after March 22, 2012, it would return to this Board to seek a new CPG. But the 2005-2006 legislature completely changed the process that Entergy was required to follow to obtain a new CPG – and it did so deliberately to inject a political roadblock into what both parties in 2002 expected to be an impartial administrative proceeding before an expert board. In my view, Act 160 of 2006 constituted a material breach of the 2002 MOU. It allowed a majority of House and Senate to vote a death sentence for Vermont Yankee for whatever reasons, or for no reasons at all, except the political urge to pander to emotional but fact-starved anti-nuclear activists. Following that breach of trust, Entergy had little choice but to litigate to keep the plant open, which it did, successfully. Now the anti-nuclear forces are howling about “trust.” I agree that there is an issue of “trust,” but it runs the other way – to the faithless legislature that broke the state’s deal and thereby freed Entergy from what it had agreed to. My recommendation is for the Board to issue a final CPG for Vermont Yankee to operate through the end of 2014, based upon the latest agreement between Entergy and the State. Then we all can finally put this embarrassing decade of state perfidy and simony behind us. John McClaughry is vice-president and co-founder of the Ethan Allen Institute. 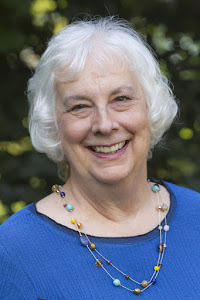 I am the director of the Energy Education Project of the Ethan Allen Institute. McClaughry sent me a copy of the comments that he sent to the PSB, and I asked if I could use these comments as a guest post. The PSB is still accepting comments in favor of the plant. For more information on the Public Service Board hearings and the Memorandum of Understanding, see the blog post Take Action: Comments to the Public Service Board. The Public Service Board is now accepting comments on the agreement (Memorandum of Understanding) which was signed by Entergy and various state agencies in December 2013. This is agreement will allow Vermont Yankee to operate until the end of the year, and will also require Vermont Yankee to pay around $40 million dollars to the state and to various funds. It's a really good deal for the state. Here's a link to the agreement. As I noted in my earlier blog post, this agreement will not take effect unless the Public Service Board grants Vermont Yankee a Certificate of Public Good substantially based upon the agreement. It's a good deal for Entergy, also, because it means that Entergy will be able to finish up this fuel cycle in a reasonable and planned manner. With this agreement, Entergy won't have to fight the state in court in order to finish this fuel cycle. The Department of Public Service, the Vermont Attorney General, the Agency of Natural Resources have all signed the agreement also. I encourage you to support this agreement in front of the Public Service Board. Please write your support of this agreement (or whatever your opinion might be), using this form on the Public Service Board site. If you live in Vermont, you might consider going to the one public hearing about this amended docket. It is Tuesday night, January 14, starting at 7 p.m. The hearing will be held all over Vermont, in the interactive TV studios set up for this purpose. Here's the announcement. Hearings will be held in Bennington, Brattleboro, Johnson, Lyndonville, Middlebury, Montpelier, Newport, Randolph Center, Rutland, Springfield, St. Albans, White River Junction, and Williston. In other words, if you live in Vermont, there's a studio near you. Also, attending these local studio events is sort of fun. Not completely fun, but sort of fun. You will see your neighbors, whether you agree with them or not. These studio events draw a different crowd than the almost-professional anti-nuclear group that comes to hearings in Montpelier or Brattleboro. You can also see people in the other TV studios on the video screen, as the camera moves from location to location. I wish I could come to Tuesday's interactive TV hearing: I have been to several like this. However, just at the same time, I need to attend an event which is important to my husband. In any rate, do email your support of the agreement, if you support it. These Public Service Board dockets about Vermont Yankee have been going on for a very looong time. "Coming up to speed" on everything is probably not a realistic option. Here's the Public Service Board site for this docket, if you want to dive in. In my opinion, you can just read the agreement itself instead of all the other material. I suggest writing something very short and simple about "being in support of the state agencies that support this agreement," and/ or "being in support of the workers at Vermont Yankee who will be able to plan their futures more effectively with this agreement." About the workers: in the last two minutes of this video, Entergy Vice President Mike Twomey explains that an overarching goal of the negotiations was to provide twelve months of certainty for the employees of Vermont Yankee. This video was taken at the December 23, 2013 press conference announcing the agreement. You can read more about the press conference, and see the entire conference on video, at this post by John Herrick at Vermont Digger. What Are Nuclear Plant Operators Doing to Prevent Another Fukushima? The Fukushima Nuclear Plant in Japan never anticipated the powerful tsunami that caused the failure of all its systems. Even today, several years after the event, the plant is under constant monitoring, and clean-up measures continue to be done to ensure the safety of the public. Whether other nuclear plant operators around the world are increasing safety measures to prevent another Fukushima disaster is a matter of public concern for everyone. Many experts believe that the problems at Fukushima occurred mainly because the operators didn’t believe a disaster of this magnitude could never happen. Unfortunately, it appears that the effects of climate change may make these sorts of natural disasters even more common. Of course, different plants around the world will be subject to a variety of environmental conditions and factors. These individual differences will not only have to be properly assessed before construction, but also considered in ongoing repairs and reinforcement as plants age. Currently, the public is averse to investing more money in nuclear power that has so many cost considerations and possible safety hazards in an age of significant climate change. Tectonic faults, ocean currents, flooding and possible water shortages must be factored into any construction design and costs. The high levels of heat that occur in the nuclear fission process are a major concern for any nuclear power plant operator. 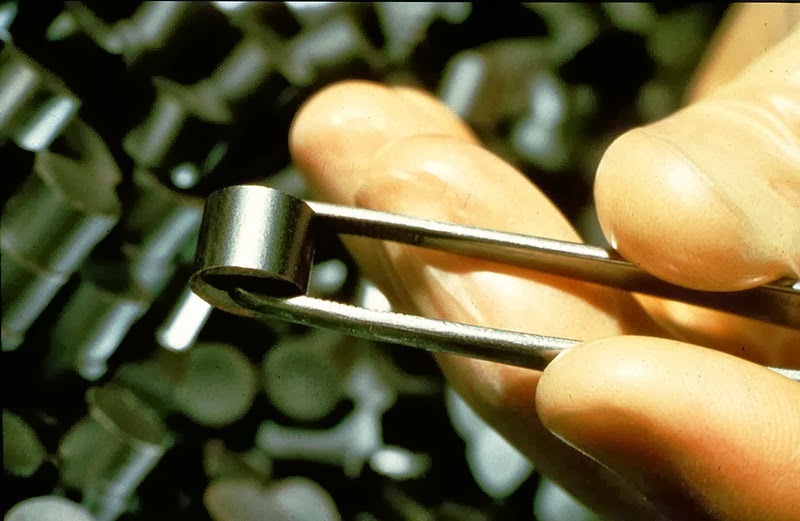 A new idea for safer fuel rods involves enclosing them in sheaths of silicon carbide that would form a tough ceramic coating that bypasses the splitting of water molecules into hydrogen gas that can ignite and explode. One of the critical problems made evident by the Fukushima disaster was failure of sufficient generators and water pumps to continue to cool the hot fuel after the power systems failed. Redundant water cooling system are not only feasible but one of the more cost effective systems that can be put in place to prevent the overheating and hydrogen explosions that created the highly hazardous situation in Japan. Another significant problem that occurred in the early days of the Fukushima disaster involved the failure of instrumentation that allowed the operators to know how much water was available in the cooling tower. This proved to be a significant handicap to providing remedial cooling in an expeditious manner. Relocating the instrumentation inside the tower yet outside the pressure vessel, while also switching from analog to digital displays, would allow operators the ability to evaluate the arrangement and condition of the fuel itself. In addition, the use of a “hodoscope,” an instrumentation device used to detect direction and intensity of radiation would help operators to determine water and fuel condition even under crisis conditions. These measures would serve to provide more accurate information about changing conditions at a plant in crisis and would allow faster implementation of remedial actions. Although many of these new technologies are still in the development stage, they are eagerly being studied by nuclear plant operators who are actively seeking ways to prevent the next Fukushima disaster and make nuclear power safer for the public under all types of unexpected conditions. Addison Appleby is an IT specialist and technology writer from Tucson, Arizona. She is fascinated by energy, robotics, and much more. I get many emails from people offering to write a guest post. I always answer: "Sorry, no, I only run guest-posts from people I know." Appleby was the exception, because she included this relevant and interesting post. I think that Appleby underestimates the amount of work needed to get NRC permission to change anything at a nuclear plant, but she has certainly done her homework on some things that might be changed. I hope her post will stimulate conversation on the subject. In 2011, the Vermont Department of Public Service released the Vermont Comprehensive Energy Plan, a plan for moving Vermont to 90% renewables for ALL energy use (not just electricity) by 2050. Except it wasn't a plan for the future. In my opinion, the Comprehensive Energy Plan was about gas pipelines, which is why I called my post about it: Hurry Up. Hurry Up. Renewables. Don't Pay Attention to the Gas Pipeline. The Plan used a lot of space talking about natural gas. Later, I wrote an op-ed: Vermont's Renewable Energy Plan is Wishful Thinking. I quoted a woman who spoke about the Comprehensive Plan at a meeting before the Public Service Board: "It's not a plan, it's a collection of slogans." Yes, in my opinion, the Comprehensive Energy Plan was a collection of slogans, along with some encouragement of natural gas. There was no plan involved. Now the Department of Public Service has a new plan--the Total Energy Study. You could describe the Total Energy Study (TES) as planning document meant to help prioritize policies, and the policies will help build a plan which will fulfill the goals (or slogans) of the Comprehensive Energy Plan. Is TES a plan? Well, yes, but not the kind of plan I would have expected. It's mainly about policy choices, not technical choices, and I'm kind of a technical-choice wonk. Here's a quote from a section called "What this report is not" from page 12 of the main document: While the Total Energy Study describes several policy and technology scenarios that are expected to achieve the State’s goals, these reports are not intended to be or replace the Comprehensive Energy Plan. Neither this report nor the TES Final Report will articulate or recommend a definitive pathway forward. TES is about policy-- mostly fiscal policy. TES is being written under contract to the Department of Public Service by Dunsky Energy Consulting, a consulting firm based in Montreal. Besides public comments, there were "stakeholder focus groups" on this study all last summer. The list of stakeholders is in the appendixes to the report. Dr. Asa Hopkins of the Department was kind enough to send me the Request for Proposal for this stage of the study. It is a public document, and I link to it here. requirements for fuel-switching (I suspect if you don't switch you may have to pay a fine). The TES document includes lengthy comments about other issues, but, basically, financial sections jumped out at me. This may be because I am a tax-payer and rate-payer in Vermont, though not a "stakeholder." I am a simple member of the public. Carbon taxes, according to TES, may be "revenue-neutral" with cutting back some other taxes, but that is hardly promised. Also, when I read something called "requirements for fuel-switching," I wonder how the requirements will work. I suspect that police will not come and shut down a business if it doesn't fuel-switch well enough. Fuel-switching won't be quite that draconian! I am pretty sure that these requirements will be enforced with....fines. In other words, fuel-switching requirements will be another source of revenue for the government. 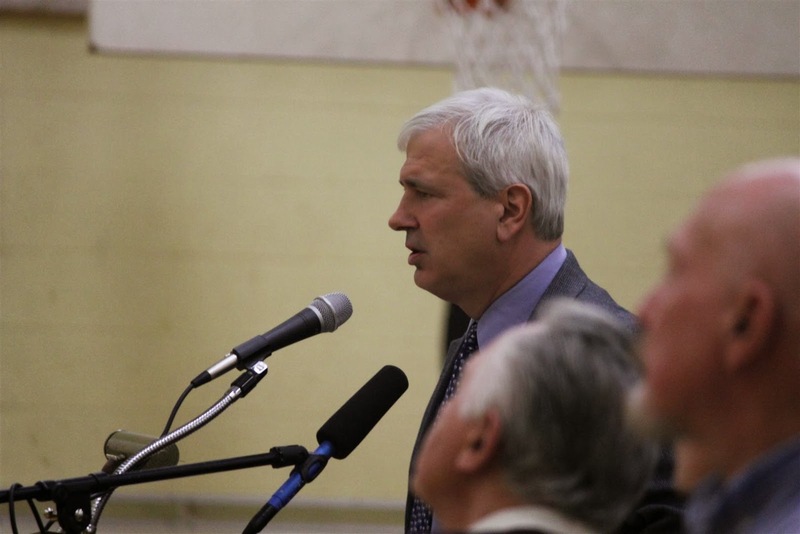 According to the Public Service Department web page on the Total Energy Study, a public meeting was held in November, before the study was published in December. However, the Framing Report for the study was available at that time. I also urge you to read the study documents, not just my opinions of the study. Draw your own conclusions and write your own comments. At this point, I want to give a hat-tip to Dr. Asa Hopkins, director of the Planning and Energy Resources Division of the Department of Public Service. Dr. Hopkins has been very helpful. I found it odd that Vermont needed a Montreal company to do a study here in Vermont, since we have so many universities and think-tanks in this state. I asked Hopkins about this, and he promptly and kindly sent me the Department's request for proposal and a list of the groups that answered that request. The contract for this study was awarded by competitive solicitation. Update and Correction: Another Thank-You to Asa Hopkins! 1) “TES is being written under contract to the Department of Public Service by Dunsky Energy Consulting, a consulting firm based in Montreal.“ The Legislative Report to which you direct your readers was not written by Dunsky Energy Consulting – it was written by PSD staff. DEC is doing qualitative and quantitative analysis for us, under the contract from the RFP you requested. Their work will be complete in the late spring. The PSD will publish a final TES Report over the summer, building on Dunsky’s work but also reflecting our own analysis. Indeed, Dr. Hopkins is correct. The words "requirements for fuel switching" do not appear in the report. My error and I apologize! I was using these words to summarize the following section of the report (page 2) I definitely should have used the words of the report itself. I am sorry. The report lists various policies under consideration, and this is one of them. A direct quote is below, but I have added the italics. "Renewable targets with carbon revenue: Draws from the previous two policy sets; here, the state would set a target for the renewable energy content of all fuels, placing a non-binding obligation on energy suppliers. If the target were not met within a given sector, however, the obligation would become mandatory within that sector or that sector’s carbon tax would be increased. This obligation structure would be paired with a small economy-wide carbon tax used to raise revenue applied to programs directed at making it easier for obligated parties to meet their target obligations." I have been following the New England Grid through the extremely cold weather of the past few days. As you would expect, electricity prices have been high, demand is high, and so forth. 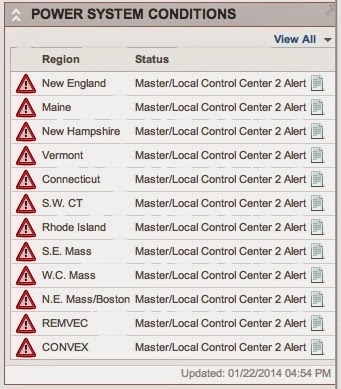 Here's a typical screen-shot of the Vermont situation this morning. 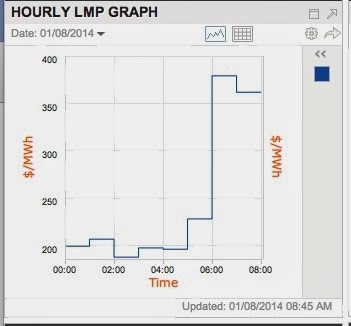 Electricity prices above 25c per kWh. 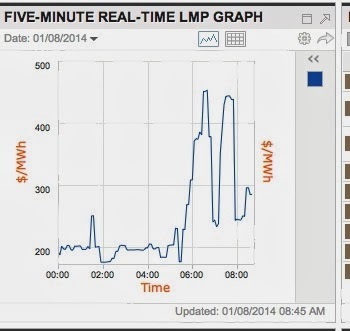 (Price of $274 per MWh is 27 cents per kWh.) This screen shot comes from the ISO-NE main website, where the price ticker keeps changing in real time. The demand is soaring, also. Here's a screen shot of the various areas in ISO-NE, including the lines feeding in from Canada, out to New York, and the cross-sound link to Long Island. Note, you can see all these charts for yourself, real time, by clicking this link. With sub-zero weather, demand and price are soaring. Of course. The interesting thing was the fuel mix. 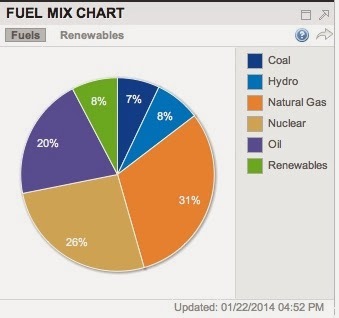 At the bottom of that same page, there's a little pie-chart of the current fuel mix. 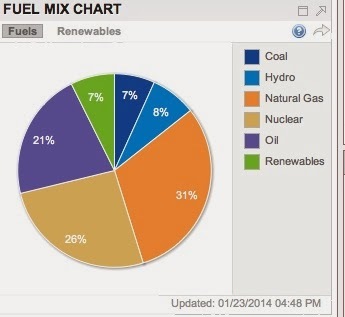 This is an astounding pie chart: nuclear and natural gas are neck-and-neck in supplying power right now. 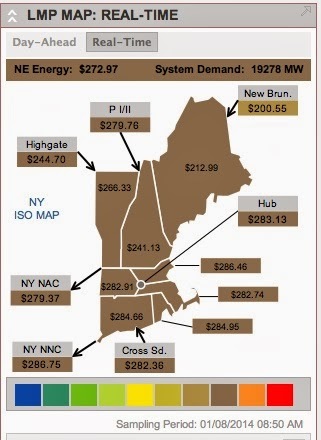 This is despite the fact that ISO-NE often says that New England is overly dependent on natural gas. The ISO-NE statement about closing Vermont Yankee noted that 52% of New England's electricity is generated with natural gas. Well, right now, New England's electricity isn't being generated by natural gas. With a high demand on the grid, nuclear is 27% and natural gas is 28%. Since nuclear power is reliable, but the amount is rather fixed, the nuclear component didn't go up. Instead, the percentage of natural gas has gone down. In other words, when we need natural gas in New England, it isn't available. But take a look at that oil percentage: 18%! And coal at 13%. The lack of availability of natural gas is old news. Indeed, the high percentage for oil shows that the ISO-NE winter reliability program is working. In that program this fall, ISO-NE (well, the rate-payers of New England) payed $75 million in capacity payments for oil-burners to have oil on site. Now that those plants are actually making power, the oil-burners are also getting high prices as they sell their power. The $75 million this fall was a "capacity"payment--a payment to have oil on-site so the oil-fired capacity is available for dispatch. ISO-New England, the region's power grid operator, told transmission and generating companies on Tuesday to halt routine maintenance to free up resources for power exports to other regions if necessary, spokeswoman Marcia Blomberg said. Some electric power plants have switched to burning oil and coal in New England in response to rising natural gas prices, she said. 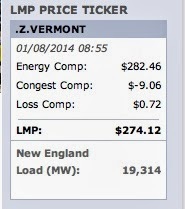 The whole situation on the grid is going to get worse next year when Vermont Yankee goes off-line. That 27% nuclear will shrink and it is very unlikely that new gas lines will have been installed. 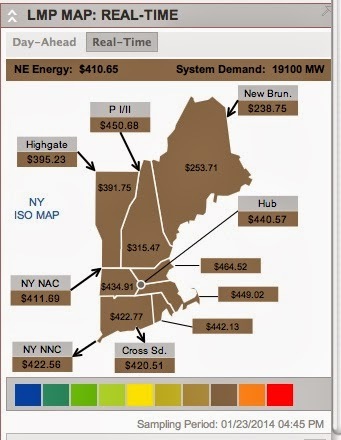 I think that coal and oil will be the new normal for the New England grid in winter. This post isn't particularly about renewables, but it has been windy, and we have had wind power. 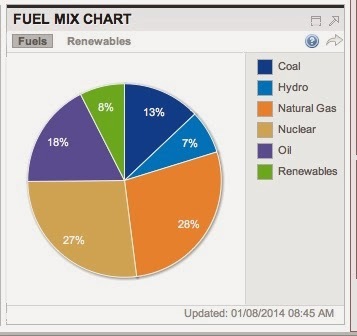 "Renewables" are 8% of the fuel mix chart above, and clicking on the "renewables" tag on that chart shows the percentage of the various renewables, as below. 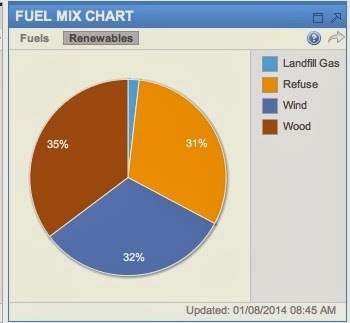 Wood and refuse are 66% of the renewables and wind is 32%. In other words, wind is about a third of 8% of the demand on the grid, or less than 3%. And it has been windy! We are not experiencing a mass of still cold air which is typical of winter. This weather system is described as a "vortex." For what it's worth, production of power from refuse and wood is relatively fixed-capacity, but the amount of wind varies. This chart covers a time when the wind power was comparatively high. When Vermont Yankee goes off-line, coal and oil will be an even bigger part of the New Normal on the winter grid in New England. Update: I recommend this NEI blog post about the grid and nuclear energy: Nuclear Fleet Shrugs Off Polar Vortex, and this article in the Hartford Courant about nuclear supplying more power to the grid than any other fuel on Tuesday afternoon when power demand was high. I have friends from Scotland who celebrate Hogmanay. An important part of the celebration is first-footing: the first person through the door in the new year is a bringer of good luck for the coming year. As Wikipedia says: The first-foot usually brings several gifts, including perhaps a coin (silver is considered good luck), bread, salt, coal, or a drink (usually whisky), which respectively represent financial prosperity, food, flavour, warmth, and good cheer. Well, nothing like reading Wikipedia. I know several people from Scotland, and I have been invited to Hogmanay celebrations. Through Wikipedia, I learned that Greece and some parts of Russia have similar customs. 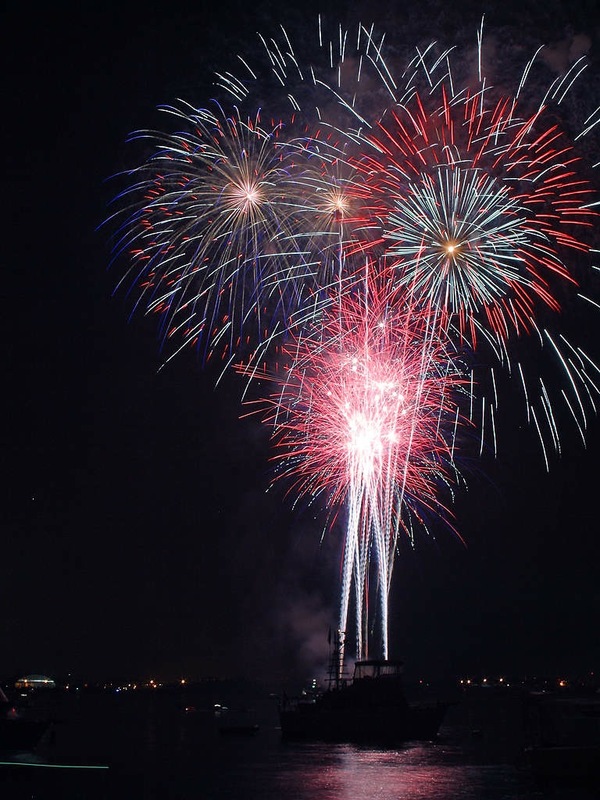 In a similar manner, this first blog post of the year is full of good wishes for the New Year. Starting off on the right foot, so to speak. Happy New Year! May it be a year of peace, health, prosperity, food, flavor, warmth and good cheer for everyone! P.S. Yes, this post is a little late, but Wikipedia has saved me again. According to Wikipedia, Hogmanay celebrations and visiting can last until mid-January. My own experiences with Hogmanay were one-night celebrations, but indeed...why stop a good thing while people are still having fun?